UK wholesale gas prices have risen 23% to 230p a therm after supply troubles forced National Grid to ask industrial users to limit their usage. On Monday prices had quadrupled after a fire shut the UK's main storage facility and the recent cold snap made domestic usage soar. If the situation gets worse, industrial users could see supplies cut off. 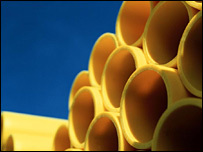 "This is as close as the UK has got to a national gas emergency," said the Energy Intensive User Group. "Supplies would effectively be rationed to industry to keep supplies maintained to households," warned the group's director Jeremy Nicholson. "The spiralling costs of energy are increasingly eating into companies' ability to compete, and with prices this high, some heavily energy-dependent firms could be forced to shut down or shut down production," said CBI director-general Sir Digby Jones. He was reiterating a warning the CBI gave last November, which was dismissed at the time by ministers as scaremongering. Trade Secretary Alan Johnson told the House of Commons on Tuesday afternoon that the present situation did not threaten domestic customers or the vast majority of commercial and industrial supply. He described the alert as a "prudent" measure and said it was not an emergency response. "Were there to be an emergency situation, National Grid will be able to maintain supplies to domestic and other key gas consumers," Mr Johnson said. The unprecedented "gas balancing alert", published by National Grid on Monday, provides industry and gas traders with early warning that demand is outstripping supply. The warning is set to trigger if forecast demand for gas rises above 380 million cubic metres on a particular day. Some of the gas shortage has also been blamed on other European countries, which have been accused of failing to supply enough gas to the UK through a special interconnecting pipeline. A recent fire that closed the large Rough Field North Sea gas storage site off the East Yorkshire coast was also to blame. The UK has had to import more supplies, either through shipments of liquefied natural gas (LNG) or via pipelines or "interconnectors" to continental Europe or the Norwegian gas fields. 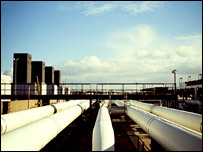 New pipelines to boost capacity are currently under construction. Householders should not worry about the warning, said Chris Mostyn, a spokesman for National Grid. "If we get to any sort of scenario where we have to take emergency action, consumers are our priority customers," he said. "It is the larger users, commerce and industry, that can be interrupted if need be. But that would be way further down the line."